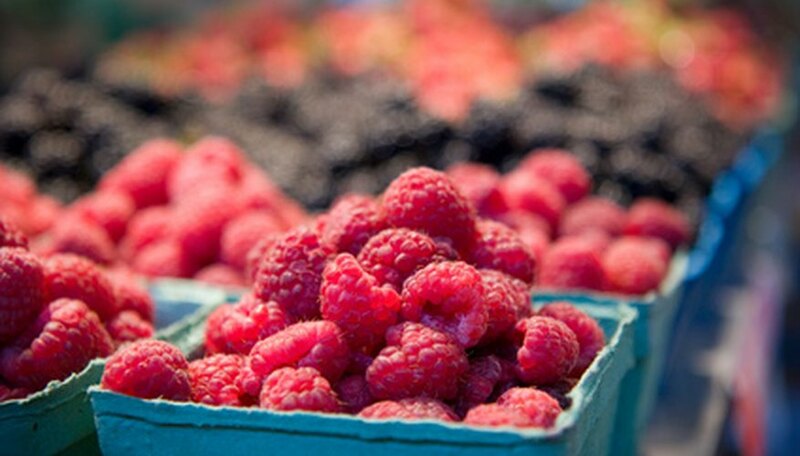 Raspberries grow on plants that produce prickly vines, known as canes. These vines twine around nearby supports, reaching upward and outward as they mature. Raspberries in their natural environment form blossoms in July that mark the location for later fruit. The flavorful pink and red berries that contain numerous seeds provide food for foraging wildlife, including deer and birds. Under favorable circumstances, the small seeds in these tasty, red berries produce new plants. Stratify your raspberry seeds before planting them in soil. Like various other types of seeds, raspberries require a period of cold temperatures to germinate into new plants. Dampen a handful of sphagnum moss in cool water. Look for this moss in your garden center of florist store. Lightly squeeze the excess moisture from your moss and sprinkle your seeds over the damp moss. Roll up and place in a plastic zipper bag. Place the bag in your refrigerator for at least one month. Keep the temperature in the refrigerator between 35 and 38 degrees F. Do not allow the seeds to freeze in a cold corner of your refrigerator. Fill a seed flat with sterile potting soil. Use a seed flat with individual, biodegradable sections to allow easy transplantation of delicate seedlings. Smooth the loose soil across the seed flat with your fingertips to provide an even surface for your seeds. Remove the sphagnum moss out of your refrigerator and unroll it to expose the seeds. Pluck the moist seeds from the moss with your fingertips, placing them gently on the surface of the soil in your seed flat. Spread the seeds evenly over the surface to avoid clumping of new sprouts. Allow a space of about ½ inch between the seeds. Cover the seeds with a light sprinkling of potting soil. Apply a layer of potting soil approximately twice the diameter of your raspberry seeds. Mist a light application of water over the tops of your planted seeds. Set the seeds in a sunny, warm spot to begin germinating. Keep the soil slightly moist while the raspberry seeds sprout, but do not soak the soil. Do not crowd your seed flat with nearby plants or objects. These plants commonly suffer from dampening-off and require adequate amounts of airflow during sprouting. Thin out your raspberry seedlings after they form their second set of leaves. Remove spindly and unhealthy seedlings to allow only the strongest ones to remain in the seed flat. Leave about 2 inches of space between your healthy seedlings. Transplant your raspberry seedlings outdoors after the last frost of the season.